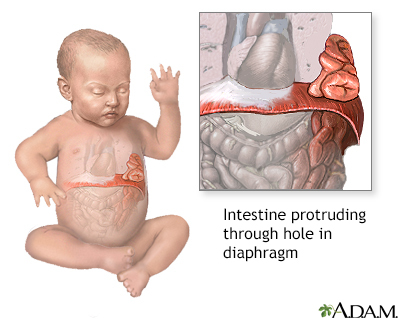 A diaphragmatic hernia is a birth defect in which there is an abnormal opening in the diaphragm. 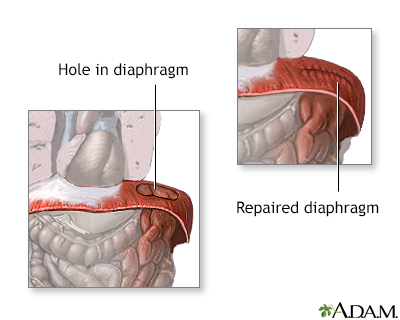 The diaphragm is the muscle between the chest and abdomen that helps you breathe. The opening allows part of the organs from the belly to move into the chest cavity near the lungs. 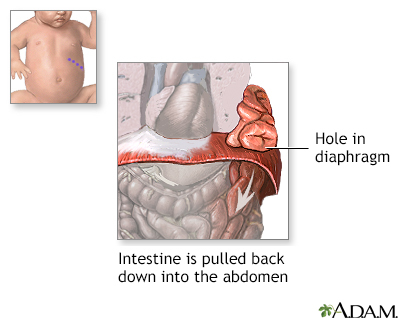 A diaphragmatic hernia is a rare defect. It occurs while the baby is developing in the womb. Because the diaphragm is not fully developed, organs, such as the stomach, small intestine, spleen, part of the liver, and the kidney, may take up part of the chest cavity. CDH most often involves only one side of the diaphragm. It is more common on the left side. Often, the lung tissue and blood vessels in the area do not develop normally either. It is not clear if the diaphragmatic hernia causes the underdeveloped lung tissue and blood vessels, or the other way around. 40% of babies with this condition have other problems as well. Having a parent or sibling with the condition increases the risk. 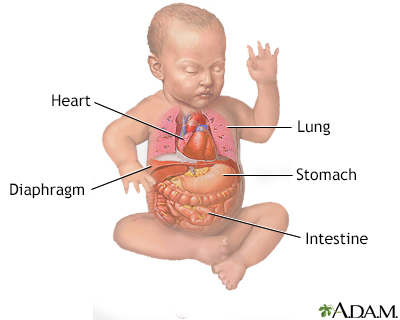 Severe breathing problems almost always develop shortly after the baby is born. This is due in part to poor movement of the diaphragm muscle and crowding of the lung tissue. Problems with breathing and oxygen levels are often due to underdeveloped lung tissue and blood vessels as well. Fetal ultrasound may show abdominal organs in the chest cavity. The pregnant woman may have a large amount of amniotic fluid. A chest x-ray may show abdominal organs in the chest cavity. 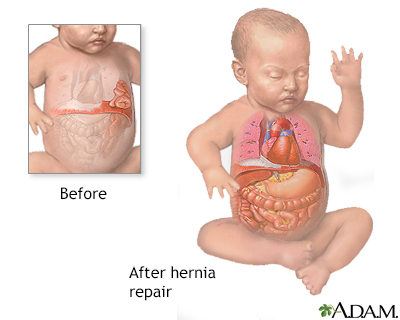 A diaphragmatic hernia repair is an emergency that requires surgery. Surgery is done to place the abdominal organs into the proper position and repair the opening in the diaphragm. The infant will need breathing support during the recovery period. Some infants are placed on a heart/lung bypass machine to help deliver enough oxygen to the body. If a diaphragmatic hernia is diagnosed early during pregnancy (before 24 to 28 weeks), fetal surgery may be an option in some situations. The outcome of surgery depends on how well the baby's lungs have developed. It also depends on whether there are any other congenital problems. Most often the outlook is good for infants who have a sufficient amount of working lung tissue and have no other problems. Medical advances have made it possible for over half of infants with this condition to survive. The babies survived will often have ongoing challenges with breathing, feeding, and growth. Go to the emergency room or call the local emergency number (such as 911). A diaphragmatic hernia is a surgical emergency. There is no known prevention. Couples with a family history of this problem may want to seek genetic counseling. Kearney RD, Lo MD. Neonatal resuscitation. In: Walls RM, Hockberger RS, Gausche-Hill M, eds. Rosen's Emergency Medicine: Concepts and Clinical Practice. 9th ed. Philadelphia, PA: Elsevier; 2018:chap 164. Tsao KJ, Lally KP. Congenital diaphragmatic hernia and eventration In: Holcomb GW, Murphy JP, Ostlie DJ, eds. Ashcraft's Pediatric Surgery. 6th ed. Philadelphia, PA: Elsevier Saunders; 2014:chap 24. An abnormal opening in the diaphragm that allows part of the abdominal organs to migrate into the chest cavity, occurring before birth.